The less time I spend on the computer, the less time I *want* to spend on the computer. Raising little kiddos is fun – and exhausting. At the end of a long day of cooking, baking, chasing, praising, chastising, feeding, changing, etc. I just don’t want to look at a screen. So, dear reader, my apologies. I’ll try not to be such a slacker here on out. Can I make it up to you by sharing a healthy, delicious, FAST recipe for the entire family? Whew! Glad to hear it. 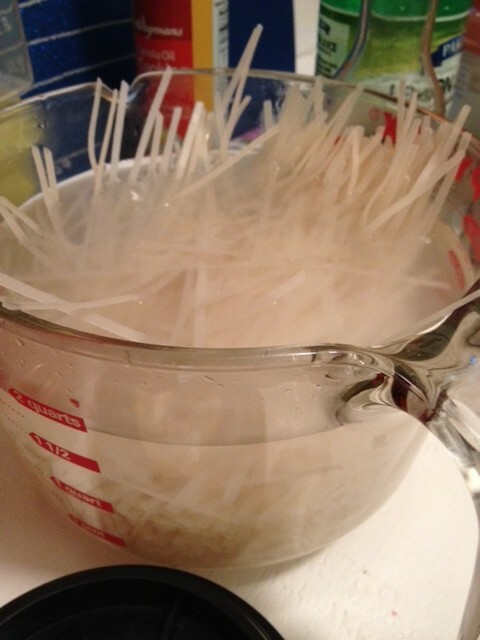 Soften rice noodles in large bowl of very hot - but not boiling - water. Defrost shrimp in bowl of cold water (or use another protein of your choice). Dice onion and cook on medium heat. Add vegetables such as broccoli and brussels sprouts, if desired. 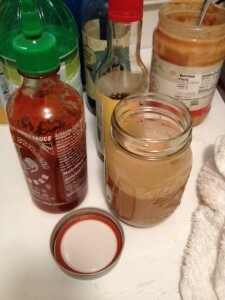 While vegetables cook, make peanutty "Pad Thai" sauce. Chop garlic clove(s) in blender. Add peanut butter, soy sauce, Sriracha, Ponzu, and lemon juice in small amounts until you achieve a balance of flavors your enjoy. 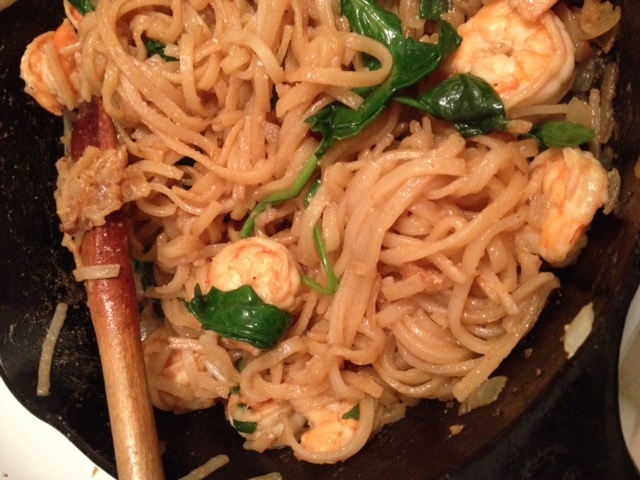 Add defrosted shrimp to pan and cook for 1 to 2 minutes each side or until shrimp are opaque. Add peanut sauce to coat. 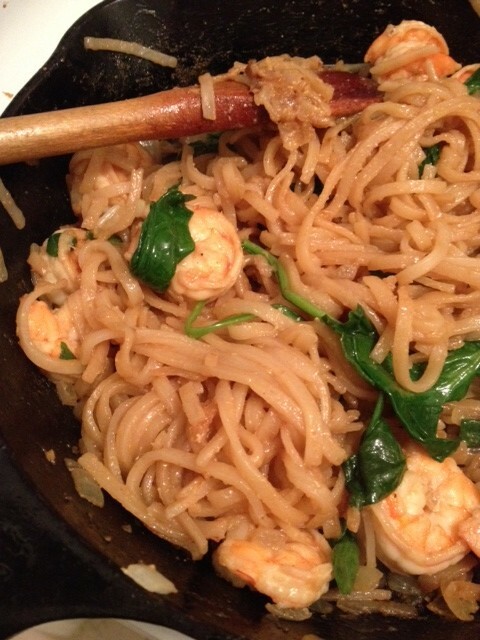 Add softened noodles and more peanut sauce. Brown noodles for a few minutes. Add fresh spinach and wilt. Serve in bowls with forks or chopsticks. How do you make Pad Thai? Please share your modifications!